A triple dip snow cone! Yay! Eat me! Thank you, I will! Oh, he’s adorable I hope nobody eats him up! Oh, how cute is this?! LOVE it! This is just darling! Such a happy illo. adorable!!! 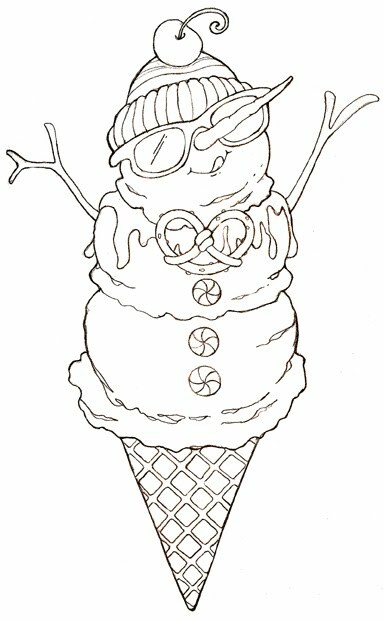 love the idea of a little snow man in a cone, fantastic! What a cool idea… themed ice cream! It’s like the Happy Meal of ice cream! Yum! Love the pretzel bow tie! It’s fun to be able to see your line work! and I voted for you too! happy easter! OK I am going to make a real one for my kids following your ilustration! Wonderful idea! Very lovely line work. Nice! cute – also like your thoughts are painting things that celebrate life and God.